I’ve had my Sous Vide Supreme water bath for a number of years now. Maybe as long as a decade. I must say that when I first got it - and it was the first of its kind designed for use in the standard home kitchen - I assumed that it was only a matter of time before it became a much more common kitchen device. Maybe it is. But at ten years and waiting, it seems to be something of a slow burn revolution at best. Still, mine is going strong, albeit that I tend to use it for just a small number of things. Principally steak (perfectly medium rare all the way through - seared at the end for flavour, of course), chicken (juiciest and most tender chicken you’ll ever eat) and then occasional other items. One thing I’d never used it for - largely because living on my own it was never the thing to cook - was a roast beef joint. As it happened, I got the opportunity recently, so thought it was time to give it a go. 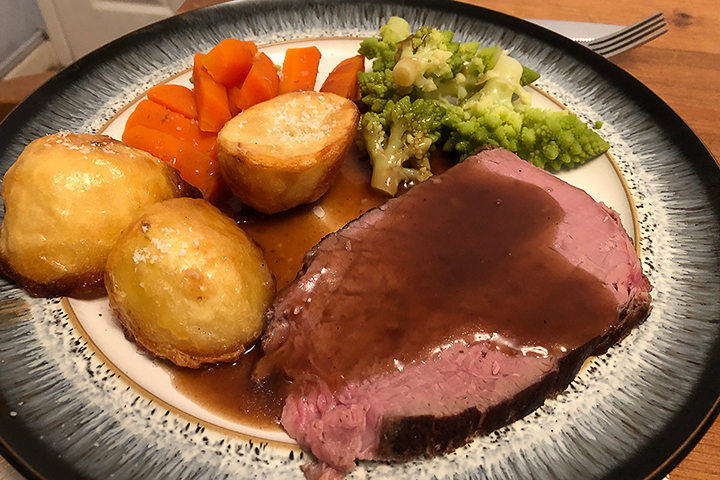 For those that are not familiar with sous vide, it’s a method for cooking to a very precise temperature, and in a way that preserves a lot more of the flavour and juiciness of whatever you’re cooking. Your food item is vacuum sealed in a bag and then put into a water bath which is held at a very precise temperature. This enables you to get perfectly cooked food all the way through, and makes it much harder to overcook something. To illustrate the point, let’s take chicken breast. Put a bird in the oven at 180ºC, you’re cooking it ideally to the point when the centre of the meat has reached a temperature of around 60ºC - which is when it’s perfectly cooked and hot enough to have killed any bacteria - especially important with poultry. But leave it too long, the 180ºC temperature will have penetrated more into the meat raising the temperature, and you may have hit something like 75ºC or higher. At that point, your breast meat is dried out and rather chewy. However, put that breast meat into a vacuum pouch along with some seasoning and thyme and drop it into a water bath being held at precisely 60ºC - well, then the meat remains juicy and the flavour is locked in. But more to the point, the temperature can never raise higher than 60ºC - so you can’t overcook your chicken. You just need to sear the meat in the pan when it comes out of the water bath, because you do want that browning effect that adds such a lot of flavour - and you won’t get that from the water bath. A chicken breast may take about half an hour. But for a full beef roast, you’re talking 24 hours at 57ºC. At that temperature, for that length of time, you will get perfectly pink roast beef all the way through and it will be as tender as you like. That’s the theory that I decided to test anyway. I just about managed to get the topside joint into the bag and seal it, dropped it into the sous vide and then forgot it for a whole day. Brought it out at the end, patted it dry and seasoned it, before searing it on all sides in a very hot pan. Did it work? You bet it did. Some of the best roast beef you’ll ever have. Does it have a huge energy footprint, given that it’s going over a full 24 hour period? Amazingly not - the water bath is incredibly heat retentive. And because water conducts heat much more effectively than air, it’s a pretty good tool.